Why were EPL players snubbed in all-star selection? 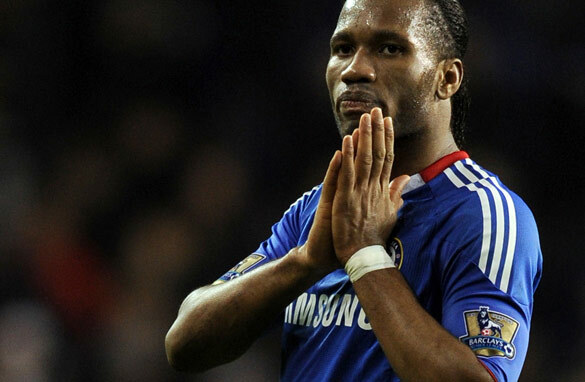 CNN's Terry Baddoo thinks Chelsea's Didier Drogba should have been included in FIFA's team of the year. The English Premier League may like to think it’s the biggest football league in the world, and certainly it spends the most money, but the 50,000 professional players, managers and journalists who voted for FIFA’s team of the year don’t appear to think it’s the best on the planet. For the first time since the award was introduced, not one player from England’s top flight made the grade. Instead, the all-star team of 2010 featured six players from Barcelona, three from Inter Milan, with the other two coming from Real Madrid. Contrast that with last year, when the EPL provided five of the elite 11, and it would seem that its reputation has taken a bit of a bashing. Of course, part of that can be put down to the fact that this was a global poll, and, with the tacit approval of FIFA and UEFA, there’s been a recent trend in world football towards putting the boot into the English game because of the vast amount of money it has thrown about in recent years. Such spending has priced many foreign clubs out of contention for big-name stars, raised the transfer fees for even the most mediocre of players by inflating the market, and made insolvency fashionable. Many people find that abhorrent, and because of that sentiment there seems to be a certain satisfaction in putting English football down. There’s also the current love affair with all things Barcelona and many things Spanish in the wake of the country's 2010 World Cup success and the Catalan club's continuing La Liga dominance. Barca retained the domestic title playing the kind of fantasy football that’s a purists dream, but unsustainable for Josep Guardiola's team or any other club, as it's built on a perfect storm of complementary talent the like of which will likely not be seen again for generations. Add the legacy of England’s World Cup debacle, and it’s easy to see why the cosmopolitan electorate looked anywhere but the EPL to fill the team of the year. However, I think that was a bit short-sighted. The Premier League - and I do mean the league itself as opposed to England per se, as the bulk of the EPL’s top stars are from overseas - produced a number of players who should certainly have been candidates for an unbiased vote based on their performances in 2010, which of course encompasses more of last season than the current one, otherwise why would Inter be so well-represented in light of their form from August to December? Chelsea striker Didier Drogba top-scored in the EPL with 29 goals in the last campaign. And, while he’s been off the boil this season, due in part to the after-effects of malaria, he’d already done enough, in my opinion, to make the cut. Florent Malouda was also stunning for the Blues last time out, which was his best season in Chelsea colors. Then there's Wayne Rooney, who had a stinking World Cup, but that should not have overshadowed what he did for Manchester United during their title challenge. And yes, I know he didn’t score a goal in open play from March last year until this month, but certainly the value of the work he did off the ball during the many games in which he failed to hit the target last season should not have been undervalued. Similarly, Frank Lampard made 17 assists last season on route to Chelsea's league and cup double, while Cesc Fabregas of Arsenal made 15, both men adding more assists than Spain’s biggest helping hand, Xavi, who made only 14 for Barcelona. Therefore, to my mind, there are at least five England-based players who deserved serious consideration on statistics alone. And that’s not even taking into account my contention that neither Barca nor Inter would have been as dominant as they were last year had they played in the EPL, where the pace, physicality and intensity of the competition week-in, week-out far surpasses that of any other league, making it harder for any one player to consistently excel. So for me, the voters got it wrong by excluding the entire EPL contingent. But then football is all about opinions isn’t it? I believe the EPL is the more competitive than the Italian and Spanish Leagues.These leagues are dominated by two teams each,Inter Milan and AC Milan and Barca and Real.M.On the other hand the EPL has 4 teams that dominate,making it hard for one player to consistently excel..
Malouda? Really? Have you ever watched football? Or do you simply listen to Chelsea's marketing executives? I'd say the same about Lampard, who hasn't been great for a few seasons and who has never been great for the National team. And Fabregas? While good, there's a reason why he hasn't gone to Barcelona, and it's because he wouldn't get into the team. I think on a position-by-position basis, the English players didn't do as well as their compatriots overseas. Are you going to put Rooney above Messi or Ronaldo or Villa? Unless you're English, the answer is no. Are you going to put Fabregas over Xavi? Same answer, unless you're English. EPL may be about pace and physicality, but the ROW doesn't care about that. There seems to be this EPL cocoon that somehow values whatever the EPL is good at more... ROW doesn't agree. If the EPL players are so good, then they are welcome to go to other "easier" leagues which according to the theory should allow them to win awards right? Not happening. English Premier League is the most marketable league, this is the same league that brought you David Beckham and said is one of the best . apart from ronaldo and owen how many players from the epl have won world player of the year in the last 20 plus years? Why do we always have at least 3 of the epl clubs in the sem finals of the uefa champ.league for the last 5 yrs?? do we rate football according to stats or acording to how much we hate what we have no reason to hate?? its all rediculous. Soccer, like the whole world, has gone crazy. just look at the goal of the yr and u'll laugh your head off!!!! Barbatov scores more beautiful goals day in day out. This hatred will do the game no good. There is so much anti English bias around it's not funny. Obviously, it's born out of pure jealousy because English clubs get so much money. Why do they attract so much cash from TV and sponsors? Because they produce the most watchable most consistent product with which those sponsors want to be associated. There are so many rubbish games in Spain and Italy where top teams can play badly and still coast to victory. Let's face it, there are just two teams in Spain, Barcelona and Real Madrid, the rest of the league is a joke. In Italy you've got the Milan sides, plus Roma, Lazio and Juventus in a good year, the rest are garbage. In Germany, Bayern Munich normally dominate in anything but a freak season like this one. In England they consistently have the big-four. (Liverpool's having a meltdown right now, but they've replaced by Man City), but Tottenham is knocking on the door, and every one of the remaining clubs in the league will give any one of the top teams a real game and sometimes beat them, Look at the Premier League table right now...a couple of slips by a top-10 team and they're hovering around the relegation zone. That shows how competitive it is, and how much parity there is in this league compared to the others. It's not a level playing field in terms of finances, but even the poorer clubs have the ability and pride to give it a go, and even if the likes of Manchester United do eventually end up taking the silverware, at least the fans have been entertained, which is the whole purpose of the football industry!. But, if your idea of a great league is watching the same two or three teams beat everyone year in year out, have at it! Watch La Liga or Serie A or the Bundesliga go round on a loop season after season. But for a real competition you can't beat the Premier League, and, with the money it generates thrown in, that's why so many international players want to test themselves in England. any as it matters liga, bundesliga and serie A will always produce the best players than ep[. from 1992 when the Premier League was formed only 4 teams have won but during the same period la liga teams have that won la liga r 5,it could have been 6 if sevila did choke on the last day. Rooney is over rated... no surprise there. Best EPL player right now has got to be either Gareth Bale or Samir Nasri. Both have been absolutely stellar thus far this season. I love watching EPL than any other league in the world. But if you ask me to, I wouldn't put any of the current EPL players in the top 20 global elite players. No rooney is not overated. he's just playing in the wrong position. He can do everything perfectly well on the pitch except scoring goals. In my opinion, he can be the best attacking midfielder, even better than Lamps but am not Fergie. EPL is such an entertaining league, so unpredictable and that's what we want as a spectator. italian and spanish league is good too but it's so predictable. about the all star selection – no doubt that the EPL players are good players as well but I was surprised by that selection too, but look at that fifa player of the yaer being messi which I believe a lot of people will not agree coz those spainsh players are way much better than him, especially during world cup. messi appears to be good only in barca, where their midfield line is so sufficiently supported so he can do all the attacking he wants smoothly. I tend to agree that there are some good players in the EPL, but none is better than the 11 players selected. The EPL is overrated. English have to look inside and fix their own problems instead of blaming everybody else (FIFA, UEFA, voters, etc., etc.). The EPL has been the richest league for years in terms of money spent (...often wasted), and when there have been English players selected, I didn't hear anybody from England blaming FIFA, UEFA, the voters, the voting system, etc etc. Look inside before you start blaming others. Learn some humility on defeat. Here in Nigeria, i am opportuned to watch a lot of European soccer and i can say that despite spain winning the world cup or Barcelona's dominance, the premier leaguee is still the toughest, totally unpredictable matches especially this season, it is not always like that anywhere else and EPL player(s) deserves a slot on Fifa's allstars list but anyway, the voters surely have their opinion but i disagree with them. FIFA MEMBERS WITH BLATTER ARE VERY GELOSE HOW ENGLISH FOOTBALL IS VERY BEAUTIFULL AND NICE ,THAT S ALL,. Buhahahaha. That's just it! You said it all! EPL is just run run run. And it is amazing how people forget so easily how bad English football was until Man United decided to play a more continental way rather than the kick and chase. Added to the fact that more non english players are dominating the EPL thus producing a more substantial success. Otherwise EPL would still be in the shadows of French Football. Of course there is always a bias towards a certain nation but considering Barca is so dominant and even so in the Champions League yet english clubs struggle internationally... I wonder what THAT says lol.